Have you decided to make your very own Ugly Christmas Sweater, but you don’t know where to start? Here are some not so simple steps to create the tackiest, funniest and most important: ugliest Christmas Sweater EVER! While you are reading this blog, try to count all of the hidden Christmas Movie Titles. Answer revealed at the end. 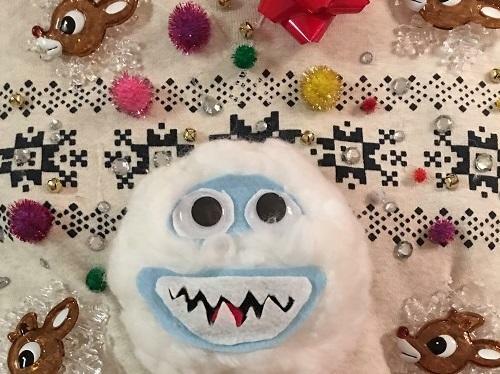 I began this blog to give you easy steps to creating the ultimate Ugly Christmas Sweater, but as I was making my sweater, the decorations got out of hand and I spent over 4 hours working on this sweater. If you don’t have that kind of time (because let’s be real, no one has that kind of time) feel free to skip some of my steps or designs completely. Grab a friend, a cup of hot cocoa, and turn on the Hallmark Christmas Channel because it is going to be a long night. Warning: This Sweater is so tacky and so unique, it may give you a nightmare before Christmas! Once you have purchased your decorations, don’t wait to put your sweater together! Do not leave any young unaccompanied minors alone with your materials, because most of the items are choking hazards. You should unwrap everything and lay it all out to make sure you are not missing anything. There are 2 large pieces to this Ugly Christmas Sweater. The front will focus on the Abominable Snowman and the Back will feature Rudolph. Separate their pieces out and plug in your glue gun. For the Abominable Snowman part you will need to gather your giant white pompom, a pair of googly eyes, scissors, 1 sheet of white, red, black and 2 blue sheets of felt. Right about now, the Silver and Gold song should be stuck in your head. Use the giant pompom to measure out how big to cut out the following felt pieces: a blue half-moon, smaller white half-moon, even smaller black half-moon and a small red circle. Blue piece is the mouth, white is the teeth, the black is inside the mouth and red is the tongue. See image B. Glue the black felt to the middle of the blue felt. See image B. Glue the red felt to the lower middle section of the black felt. See image B. Take the white felt and cut out teeth, then glue the outer edge of the teeth to the blue and black felt. Don’t glue the pointed edge of the teeth down; this will let the pointed teeth sick out. Then make the eyes by cutting out a small peanut shape in the light blue felt. See image B. Cut 2 ovals in the white felt. Make sure the ovals are smaller than the blue peanut, but larger than the googly eyes. Glue the googly eyes to the white felt. Then glue those pieces to the blue felt. See image C.
Before gluing these pieces to the giant pompom, flatten the pompom by pressing it against a table. Glue pieces to the flattest side of the pompom. See image C.
If the head looks more like Frosty and less like the Abominable Snowman, you didn’t use enough blue felt. You now have the Abominable Snowman head. Beware of the Bumble’s Roar! For the Rudolph head, collect the dark brown and gold pieces of felt, a pair of googly eyes, 1 large red sparkle mix pompom, and 2 bowls. Place the bowls side by side on top of the dark brown felt. Trace around the first bowl and make to make a large peanut shape for the head. See image D.
Cut out the peanut shaped felt and place it to the side. See image E.
Grab the excess dark brown felt to cut out small ears in the shape of a raindrop. See image E.
Fold the gold felt in half, vertically. Trace out 1 antler on the folder gold felt, and cut it out. When you unfold the felt, there should be 2 antlers. See image E.
Glue the antlers and the ears to the back of the smaller end of the reindeer head. Turn the brown felt over to glue on the googly eyes and the red sparkle pompom as a nose. See image F.
Take Rudolph and glue his head to the back of the sweater. Yes, the back. The Abominable Snowman Head is going on the front (but not yet)! Try to aim for the more centralized pot, because you will be adding lights around him. Wow that Rudolph looks so good he could light up Santa’s Sleigh on Christmas Eve Night! It’s time to add the music lights! If your musical lights are as large and as heavy as mine are, you will need and extra glue stick for this part. Clear an area to lay your entire sweater down, and collect your musical lights, a pencil, glue gun and scissors. Test the lights to make sure they Jingle All the Way. Lay out the lights in the shape of an oval, leaving enough space between the lights for other decorations and a large circle in the middle for the Abominable Snowman head. Use the pencil to make the location of each blub. Cut a 1-inch vertical slit over your pencil marks. See image G.
Put the string of lights inside the sweater and line each light with a hole. Push one light through each slit. Leave the wires inside the sweater. See image H.
Use the hot glue gun to close the slit and keep the light in place. See image H.
Grab a left over piece of felt to create a pocket for the music box on the inside of the sweater. See image I. Glue 3 of the 4 sides of the felt to the inside of the sweater and slide the music box inside. See image I. Depending on the type of lights you bought, this part could be simple or more difficult. I love to do things the difficult way so I bought sharp pointy stars that look like snowflakes. Start by laying out the lights on the sweater around Rudolph’s head. Once the lights are exactly where you want them, take the pencil and mark small dots by the light. Cut a vertical slit over the pencil marks, just large enough to push the light through. See image J. Put the strand of lights inside the sweater. One by one, align the lights with a corresponding slit in the sweater. Push the light through and use your glue gun to seal the hole and keep the light in place. Take any piece of felt to create a pocket for the battery box on the inside of the sweater. Glue 3 of the 4 sides of the felt to the inside of the sweater and slide the battery box inside. See image K.
Lift the sweater up to make sure all of your lights stay in place! Lay your sweater down with the front side face down. It’s time to decorate the back! You should be looking at a giant Rudolph head and lights around it. This is not the time to be a Cookie Cutter decorator! It’s time to heat up that glue gun because Santa Claus is Coming to Town and you need to have the most decorated sweater out there! Split all of your decorations in half. This doesn’t need to be precise, but you don’t want to favor either side of the sweater. That’s where most people go wrong, they forget about the back of the sweater. Use your hot glue gun to secure the pompoms, rhinestones, bows and the bells! Cover the back of the sleeves and all of the plain empty spots on the back. See image L.
I can’t tell you where to glue things down, because that is the fun of a DIY project. However, I can make you a special mistletoe promise: I promise that with Hearts of Christmas spirit, your ugly Christmas sweater will make almost everyone smile! You are so close to being done! Grab a couple Christmas cookies, do a few stretches and let it snow decorations! Start with your abominable snowman head, by gluing back of the head of the sweater. Then press the head onto the sweater and hold in place for about 10 seconds. Let it dry and cool down. Take the other half of your decorations and use up the rest of your glue sticks! See image M.
Don’t be shy when adding the rest of your pompoms, rhinestones, bows and bells! Use the hot glue directly on the decoration then place it on the sweater in any spot. The key to this sweater is the chaotic placement of each decoration. Show that sweater off by walking around the halls of your office. You definitely won this Ugly Christmas Sweater Competition! After 5 hours of shopping, planning, cutting, gluing and burning your fingertips off, you might be rewarded with a prize and bragging rights until next Christmas. So enjoy your sweater and always remember: it’s a wonderful life! There are eleven movie titles hidden in the Blog. Did you find them all? Curious to see how the Spinnaker Resorts Ugly Sweater competition turned out? Follow us on Facebook and view the Christmas 2016 Photo Album!